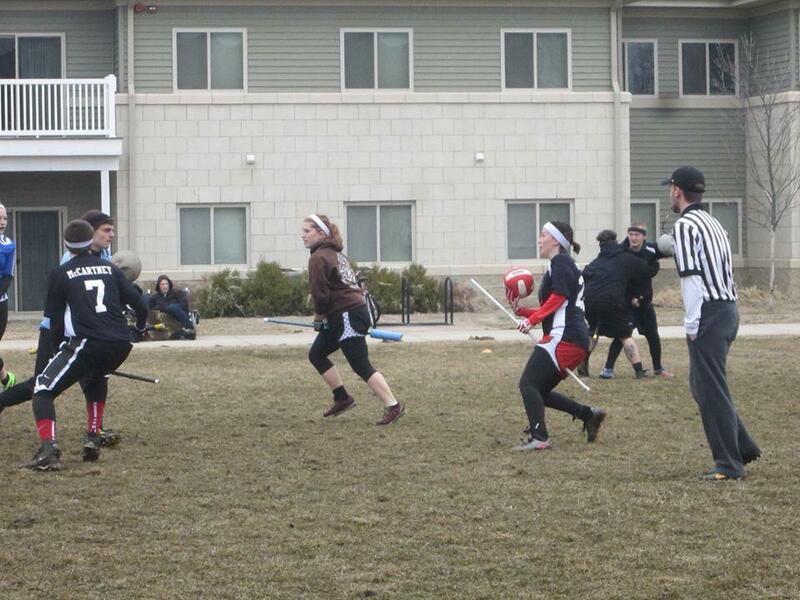 IUSB’s Quidditch team at a past practice. IU South Bend’s Quidditch team will have a spot in the International Quidditch Association (IQA) World Cup Tournament, according Sarah Knowlton, team president . IUSB’s spot first belonged to Marquette University, but they dropped out. After two other teams declined the invitation, IUSB was given the chance to compete. This is the first time IUSB has participated in the IQA World Cup. This year the tournament will be held in Myrtle Beach, N.C., and will host more than 80 teams from all over the world. IUSB will also be competing against Stanford and Rutgers. Knowlton thinks they have a chance against the teams, “and I think we can hold our own against Texas,” she added. The team estimates that they’ll need to raise $2,750 dollars for the trip. They’ve set up donations websites and have been tabling on campus. According to Knowlton, they have also put in a request with the SGA and the Club Sports Council, as well as hosting an off-campus bake sale and an on-campus t-shirt sale. The team plans on leaving Thursday evening, March 3, and arriving midday on Friday. The actual tournament doesn’t begin until Saturday, but IUSB will be at the tournament location by Friday evening. Even though the tournament will have many teams from the Midwest, the only teams from Indiana will be IUSB and Ball State University. “This is our third year, so we’re still growing and developing a little. Some of these teams have been around for a long time,” Knowlton said. To donate to the IUSB Quidditch Club’s fundraiser, visit their donation page at www.gofundme.com/7r4xqk. For more information and live updates on the IQA World Cup, visit the World Cup website at www.iqaworldcup.com.